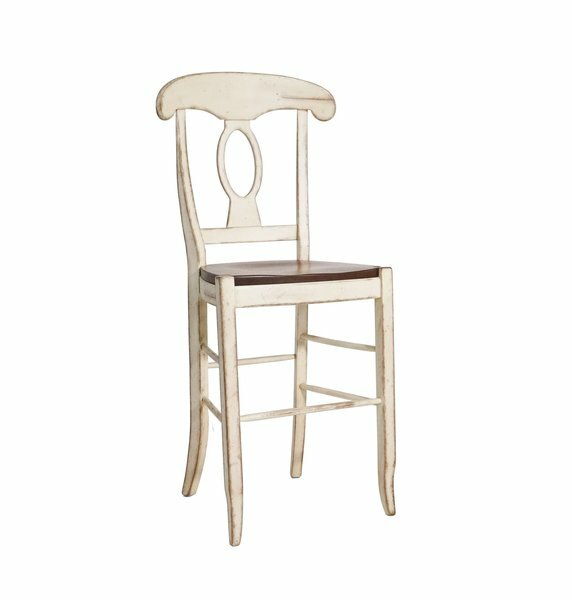 The Napolean French Country Bar Stool is a contemporary twist on the traditional French Country style. With a unique oval ring crafted into the back support, this stool offers a distinct, yet gentle style for your lounging area. The French Country charm is truly beautiful, and perfect for a cottage or farmhouse feel. The Napolean French Country Bar Stool is available in a number of high quality, immensely beautiful solid hardwoods. Available hardwoods include Oak, Maple, Brown Maple, and Cherry. Don't buy new, cheap, imported chairs every 3 years. Get a quality, American, handcrafted set of dining room chairs to last you a lifetime, and be proud of your home! Include the matching Amish Napoleon Pub Table with your bar stool purchase to create a beautiful matching pub set. My experience with DutchCrafters was excellent. Valerie was so pleasant and so helpful with any questions that I had. We love our new kitchen island and chairs. Everyone that sees it just loves it.